ETA: Congratulations to our winner, Sandra G.
Sandra has been notified and her prize will be on the way to her shortly! Thank you to everyone who entered. I’m so proud of this final book in the Decadent Dukes Society. For those who have bought copies of Never Deny A Duke, I know you will enjoy it too! 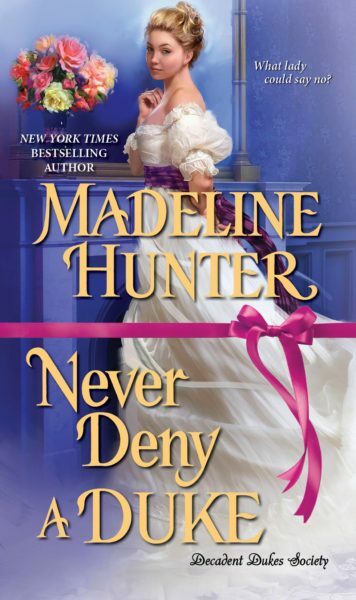 My last book in the Decadent Dukes Society, Never Deny A Duke, arrives April 30! To celebrate, I’m having a giveaway (for U.S. residents) for one free copy of the book, plus a special jewel. See the Rafflecopter below for details. Thank you for entering and good luck! Congratulations to Eileen P. We’ll get your package in the mail to you shortly! Thank you, everyone, for sharing your favorite season with me. I got so much joy reading through your comments, especially when the days got short and a little more dreary. Fall is a lovely time of year where I live. We tend to cool off quickly, so we waste no time in getting out the slow cookers and the big tea mugs. To celebrate all things indoor-cozy and autumn, I’m having a giveaway. 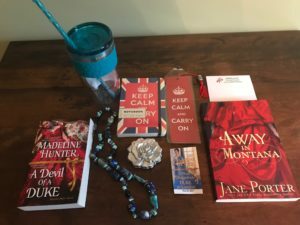 One prize package of one blue stone necklace, thermal cup, mini notebook, bookmark, post-it notes, magnet, compact, copy of A Devil of a Duke and Jane Porter’s Away in Montana, is available to win. Easy ways to enter are detailed below. First, though, say “hello,” and tell me your favorite season in the comments. To do this, scroll down past the other comments to the form below the post. You cannot leave a comment in the Rafflecopter. Make sure you mark yourself as commented to earn one entry. Additional entries can be earned by following me on Amazon and Bookbub. Already a follower? Then help yourself to another entry by marking it done in the Rafflecopter widget. The contest ends midnight on November 20. Open to USA residents only. Winner to be notified via email. Winner will be announced on this page. So don’t delay. Enter today!